Edward has helped many cancer patients recover faster from chemo and radiation therapy in Houston. Many cancer patients fly in from other states for Edward’s cancer recovery therapy. Edward has worked closely with Dr. Baisong Zhong to develop the necessary skills to treat cancer patients. Through years of experience of working with cancer patients and in a cancer clinic, Edward has developed several special techniques in helping patient resolve the side effects of chemo and radiation therapy. 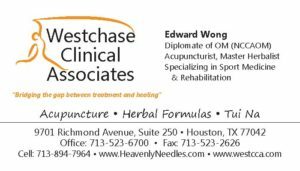 Edward has also worked with Dr. Tannaz Armaghany at Westchase Clinical Associates with the oncology team to rehabilitate and reduce the side effects of chemotherapy and radiation therapy. QiGong is also available for Cancer Support Therapy. Certain kinds of food and herbs can be used to strengthen recovery and prevent cancer from growing again.